Comet 3D/Biela was a Jupiter Family comet discovered in 1772 by Montaigne and, independentely, by Messier. It was identified as periodic in 1826 by Wilhelm Van Biela (period 6.6 years). In the following decades, the comet disintegrated and in 1872, quoting Wikipedia , "...a brilliant meteor shower (3,000 per hour) was observed radiating from the part of the sky where the comet had been predicted to cross in September 1872. This was the date when Earth intersected the comet's trajectory. These meteors became known as the Andromedids or "Bielids" and it seems apparent that they were produced by the breakup of the comet. The meteors were seen again on subsequent occasions for the rest of the 19th century, but have now faded away, probably due to gravitational disruption of the main filaments". Looking at JPL Small-Body Database Browser, it seems that the current Apollo asteroid 2016 WU9 orbit bears some resemblance with the orbit of comet 3D/Biela (orbital element estimated at epoch 1832-Dec-03.0). 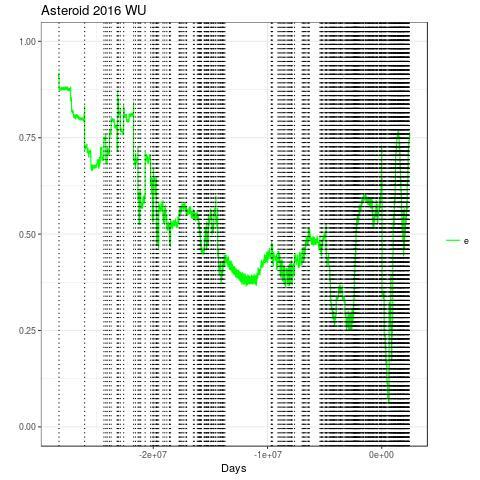 One can wonder whether asteroid 2016 WU9 is a remnant of comet 3D/Biela. In order to answer, it would be important to be able to model the effect of non gravitational forces. I am unable to do that but I show you the result of a simulation done with Mercury6 taking into account only gravitational forces. 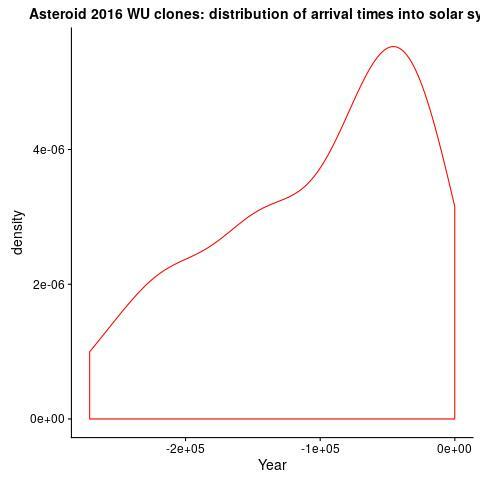 In order to perform the simulation I generated 100 clones of asteroid 2016 WU9 (same average orbital parameters as the nominal ones and standard deviation almost about the one calculated by JPL). I also simulated the behavior of nominal comet 3D/Biela for which I do not find the uncertainty estimates. 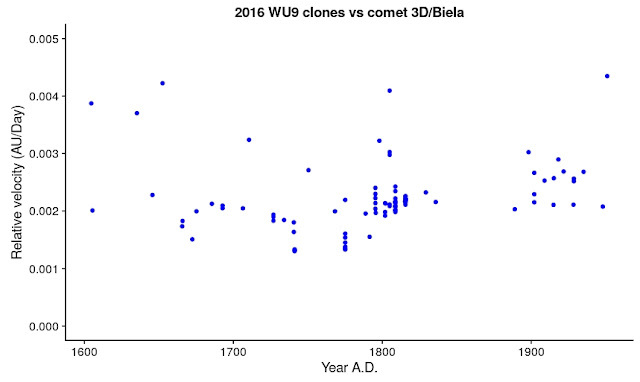 Thus, I evaluated 100 couples with an R script to check whether there was a moment in the past when two clones were very near to comet 3D/Biela with a very low relative velocity. 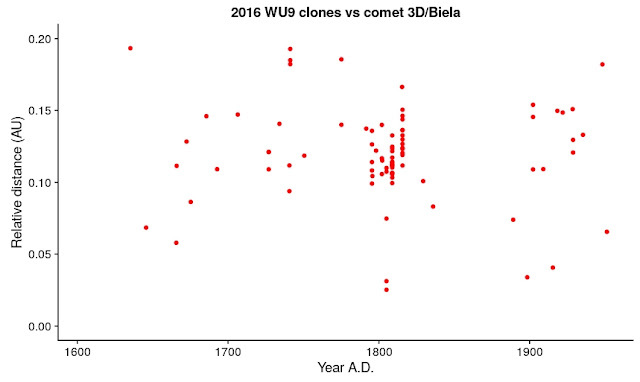 First, you see a graph showing the relative distance between 2016 WU9 clones and come 3D/Biela (some outliers not shown). Second, the correspondent graph for relative velocities. At first glance nothing impressive but around January 1806, one clone and nominal comet D/Biela were separated by a distance of about 10 LD (i.e. 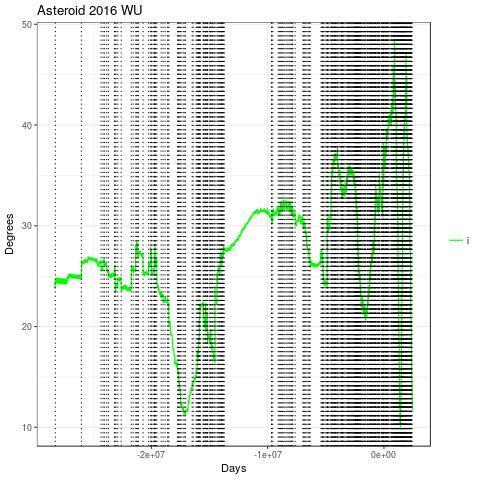 0.025 AU) with a relative velocity 0.0030 AU/Day. For comparison: I read that in 1852 two fragments comet A and comet B were observed and their distance was estimated to be about 2.5 million km (i.e 6 LD). for a few clones, the order of magnitude of the distance may be compatible with 2016 WU9 being a fragment of the comet. Not clear to me if this is just a coincidence or there could be more. 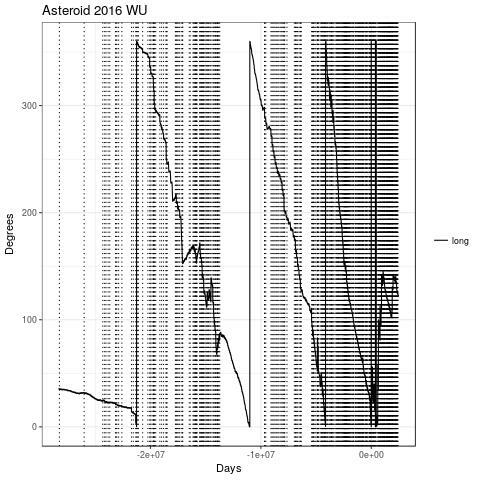 While the relation between asteroid 2016 WU9 and comet 3D/Biela remains highly speculative, I think it is interesting to note a second result of the simulation of asteroid 2016 WU9: this Apollo asteroid seems to move on an unstable orbit, it might have a cometary origin itself (whether or not it is related to comet 3D/Biela). 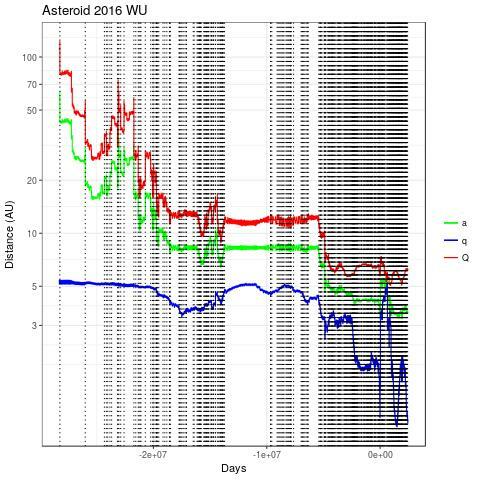 Of course, the uncertainty is very high, but, at least, this result is consistent with the fact that asteroid 2006 WU9 appears in the Asteroids with Comet-Like Orbits: Elements and Positions by Fernandez. Every clone has its own story, no reason to choose a specific one.